Mrs Best Beer HQ strikes again. She surprised me with a bottle of ‘The Rogue Hop’ NZ Pilsner by Harington’s Breweries because, first of all, she recognised the name of the brewery from when we used to live in Christchurch many years ago, and secondly, because it was cheap at around $6 for a 500ml bottle. Blurb on the bottle: This NZ Pilsner comes alive when our enthusiastic brewers unleash the “rogue hop” into the kettle; cutting loose gooseberry aroma, peach/apricot flavours and a squeaky clean finish. Fresh like a dip at the Waimak Gorge. Who? Crafted and bottle by the genuine folks at Harrington’s Breweries, 199 Ferry Road, Christchurch, New Zealand (established in 1991). I’ve reviewed only one of their beers before – ‘The Classy Red’ Extra Special Bitter. This beer tastes like: A cheap and cheerful pilsner; if not a terribly exciting one. 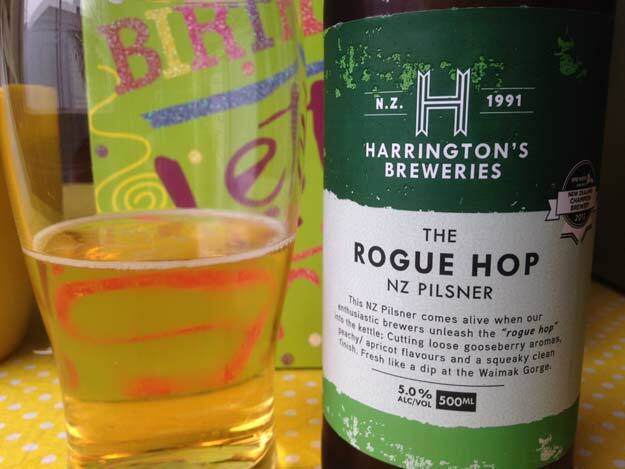 Harrington’s Rogue Hop NZ Pilsner just isn’t as hoppy as I would have liked – or as the blurb on the bottle suggested it would be – with no stone-fruit flavours “cutting loose”. Instead, it’s rather grassy, with a strong sampling of sweet malt. It’s certainly crisp, though, and highly quaffable. Try a bottle after you’ve mowed the lawns, or done some work around the yard. Just don’t over-analyse it – as I’m doing right now for this review – because you’ll soon realise that there’s nothing much to this beer at all. The verdict: This isn’t the best pilsner I’ve ever had; nor is the worst. It’s just a bit forgettable, really. Beer/movie pairing: Just as I’ll struggle to remember Harrington’s Rogue Hop NZ Pilsner in a few days from now, Jim Carrey won’t remember anything of his past relationship with Kate Winslet after he gets those memories wiped from his brain in Eternal Sunshine of the Spotless Mind, a brilliant romantic science-fiction comedy-drama from 2004.